PictureToTV by PictureToTV is a little bit spartanic but the results and effects this application offer is simply stunning! It's an easy to use application to create a VideoCD or Super VideoCD holding your photo's (either made with a digital camera or scanned). In this short guide I'll show you how to create your own Photo-VideoCD or Photo-Super VideoCD, which you can playback on your PC and on most standalone DVD-players. Note: not all DVD players are capable of playing VideoCD or Super VideoCD. Note: All screen shots are based on version 1.40. Different versions might appear slightly different. PictureToTV (personal edition) can be bought for app. $39. The SVCD (higher resolution) plugin is app. $14. In a bundle package it's app $49. There is also a business edition, but knowing the price is app. $300, I don't think many people will go there. You can also download the trial version. The trial version is fully functional. However, it will print the words "EVALUATION COPY" on all created videos. This will be removed upon registering the software. For more details see the PictureToTV website. Check "I accept the agreement" and click "Next". Optionally you can first change the installation path to the path you wish to use. However I would recommend keeping the default path. PictureToTV: Which menu do you want? Optionally you can first change the menu to a new name or select an existing menu, not recommended though. Here the setup wants to know if you do need additional shortcuts (on your desktop and/or in the quick launch bar located next to the Windows Start button). I would like to recommend un checking both options. The next screen informs you what setup will do. Click "Next" again. After that, PictureToTV will start copying files and thus install PictureToTV. Optionally you can check "Launch PictureToTV", this will start PictureToTV once you click "finish". If you don't want to have PictureToTV start instantly, then make sure you uncheck this option. Now click "Finish". PictureToTV is installed. Before continuing: make sure you installed PictureToTV first! Note: The Super VideoCD (SVCD) plugin is OPTIONAL. You either have it when you bought the package deal (getting PictureToTV + SVCD plugin) or you bought the SVCD plugin separately! If you have done none of these two options, then you can skip this paragraph! Now locate the Super VideoCD plugin installation file. Mine was called p2tvsvcd.exe, double click it. The installation process is again pretty straight forward. A screen will now appear, welcoming you to the setup. Again, a window will ask you to agree with the license agreement. Check "I accept the agreement". The next window will ask you where to install the plugin. Setup therefore needs to know the ROOT directory of PictureToTV, by default this is C:\Program Files\PictureToTV\, unless of course you selected another directory to install PictureToTV in during the PictureToTV setup. Setup now wants to know in which windows start-menu you want a shortcut to "Uninstall SVCD plugin". Simply ignore the question and click "Next". Finally a window indicates that it's ready to install the plugin. Quickly after that a window confirms that the installation has been completed. OK, let's start PictureToTV. Either this already happened because you checked the option "Launch PictureToTV" during setup or you will have to click the windows start menu (START - PROGRAMS - PICTURETOTV - PICTURETOTV). Option A: For those that want to try the trail version first, click "Register Later" (this question will show each time you start PictureToTV until you register it). Clicking "Buy Now" will bring you to the PictureToTV website where you can register and pay. You then will receive a registration key. After entering e-mail address and registration key, click "OK". A new popup window will inform you that your 're registered now. Either way, the PictureToTV screen will now open, showing you the "Tip of the day". Personally I don't like these tip-thingies but some users might find these very helpful! Before we start creating our first picture (Super) VideoCD, you might want to familiarize yourself a bit with the interface. It might be an unusual interface but it really isn't. Actually it's the most down to earth, but functional complete, interface I have seen so far for this type of application! Here we can navigate through our albums. By default "Album 1" (A) has been create to let you start working straight away! In area (A) all your albums, for this particular VideoCD, are visible. In this area, you will see the actual content of an album, meaning: the pictures of your album. Later on we will see more about this area as we start adding pictures. The arrow indicates additional controls for this particular area. The controls reflect actions on items in an album. The generic controls area is for navigating through the application. PREVIEW Shows you a preview of the entire VideoCD, including menus. This is the area where we get our content from for populating the Albums. Tip: Also keep an eye on the progressbar indicated by arrow D. It shows you how full your VideoCD will be! Basically (A) and (B) together work in a similar fashion as you already might know it from the Windows Explorer. On the left (A) you can select a folder, on the right (B) you basically select files. From (B) you can either drag pictures to the "Album Content Area" or you can click the -button in order to add a selected image file to the active album. Here you select the filter to apply on the content shown in (B). This means that if the filter is "Supported Image Files", than in (B) you will only see images. Optionally you can set this to "All Files" thus showing all files. (D) is an indicator which gives you an estimation on disk space used on the (Super) VideoCD you are currently creating. This is a real must for applications like this: by checking the options "Store original pictures", PictureToTV stores the original pictures in a separate folders. This is great because the original pictures can then later easily being accessed to make high quality hard copies. Now that we are familiar with the interface, it's time to create our first Photo (Super) VideoCD. Like I said before; the quality of VideoCD is excellent, so most of us will be very happy without the optional Super VideoCD plugin. Tip: For more information on the differences between VideoCD and Super VideoCD: please read the Video Formats page. As of this point I assume you just started PictureToTV as seen in "Starting PictureToTV for the first time". By default one album already exists, called "Album 1". Keep in mind that you can create multiple albums. So it's not a bad idea to start the entire process by sorting/organizing your images. Already thinking in terms of "albums". Note: For each Picture VideoCD (use the "File" menu) you create you can save the project file for easy retrieval later on. The first thing to do, I guess, is to populate the first album with some pictures. Note: You cannot create an album within an album! Simply use the file area to locate you images. Drag items (files) from the File Area to the Album Content Area as shown with the red arrow in the screen shot below, by left clicking the image (keep the left mouse button pressed). Move the mouse over the Album Content Area and release the left mouse button. You can also select multiple items either by pressing the SHIFT key, selecting from image to image (range). Or by using the CTRL key, selecting individual images. Repeat this step until you think your album is filled with images as you see fit. Tip: You can also use the Windows Explorer to drag images/pictures from. simply drop them on the Album Content Area. Note: PictureToTV supports BMP, JPG, PNG, TIF, PCX, PGM, PICT, TGA, WMF, and even EPS formatted pictures. 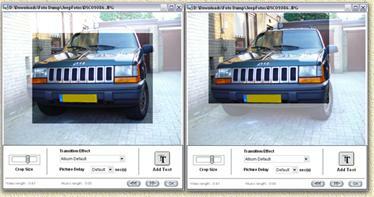 Most digital camera's use JPG (JPEG) images, where as most scanners tend to use TIF (TIFF) images. You can also change the order of the items within the Album Content Area by dragging one or more items to a different position (ie. drop the files in front of the image where you want them to appear). After populating the first album, you might want to rename the "Album 1" (later on this can be optionally made visible when creating the menu). Click the name in the Album Area and press the rename button ( ). Now enter the new name of your first album. The next step is to create a new album. Click the new album button ( ) in the Album Area. If you want to, you can already give this new album a new name, using the rename button ( ). An existing album can also be deleted. However, when you populated the album you want to delete ( ): be aware that the images within the album will be removed as well (not the actual files!). The order in which albums appear can be changed by clicking the album you want to move and then using the up ( ) and down ( ) buttons. Now repeat step 1 for the newly created album(s). Keep repeating steps 1 and 2 until you have included all your pictures or until the CD is full (see the progress bar at the bottom of the screen). Tip: You can also drag images from one album to another. Simply open the source album and select the files you want to move to another album. The drag the selection over the album name in the Album Area and release the mouse button. Adding transition effects (the effect used when going from one image to another) is pretty straight forward and can be done on two levels. One level is to apply an effect on all items within an album, the second level is to apply effects per individual image. To apply an effect on the entire album, click the "Effects" button in the Generic Controls Area. You will now see the File Area change, showing details on effects. Random, Blinds, Circle, Contrast, Dissolve, Expansion Morph, Fade, Old Film, Rotate In, Shutter, Swirl, Twist, Zoom In, and finally Zoom Out. I have to say that in particular the "Old Film" effect is really cool! From the drop down list box you can select the effect you would like. On the right you will see a preview. On this page you can also manipulate timing. When you're done selecting and setting the transition effect, simply click the "Import" button in the Generic Controls Area. Here we see some great settings we can apply to a single image. To start with what we came here for: the Transition Effect. This specifies the transition between this image and the next image in the album. You can also adjust the playback time of an image (Picture Delay). Another great thing is that you can specify Crop Size, so you can determine which part of the image is being displayed in the VideoCD. 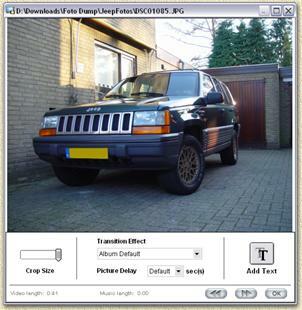 The Crop Size slider changes the visible area of a picture. As you can see in the first screen shot above, the invisible area is much lighter than the visible area (the square). When clicking the visible are with the left mouse button (and keeping the mouse button pressed) you can shift the visible area to a more suitable place. When clicking the "Add Text button" ( ), the text options appear. Switch to TEXT mode, so you can enter text (click somewhere on the picture and start entering text. So after adding images, albums, effects and maybe even text, we now come to the option to add music. This is optional! So you don't need to add sound. It does however cheer up the entire slide show! In order to add music, first click the "Music" button in the Generic Controls Area. Now the File Area again changes. An empty list appears. Use the Add button ( ) to add music. A dialog appears and allows you to select music files (supported types are WAV, MP3 and OGG). In the File Area you will also see the playback time of the album and the playback time of the music. This way you will be able to see if the music is to short or to long. You can add multiple pices of music. The music you add here will be applied to the current album. Music can be played with the play button ( ) or removed with the remove button ( ). After doing all this work, it would be nice to have a nice navigation menu. Let's create one. Click the "Disc Menu" button from the Generic Controls Area. This time not only the File Area but also the Album Content Area changes. Compared to version 1.30 the menu options are strongly improved and offers great flexibility. PictureToTV: Ready to create a menu? The File Area changed. Here we can select a predefined menu template. You can select our own background image if you want to (click "Browse" to use a different image, or click "Default" to use the default menu background for the template). We can also add some music to the menu (either select "none" or click the "Browse" button next to the "Menu Music" field to select a file). In the Album Content Area, we now see a preview of the menu. Using the arrow buttons (left and right) you can select the menu page you want to edit (each menu page can be edited individually - changes will reflect in all menu pages!). Clicking the "Edit" button, you can customize the menu view to your needs. In this window you can move the menu thumbnails and the menu arrows. You can also edit the album numbers and album text layout (font etc.). As we have seen in Adding Effect to individual picture, we can here also use the "Add Text" button to add text to the menu page. Before you continue with the next step, it's a very good idea to preview the VideoCD. Note: if your PC is too slow, it might not be able to keep up and show some minor glitches - don't worry, it won't show in the final VideoCD. Click the purple "Preview" button in the Generic Controls Area to activate preview. The controls on the right represent the remote control of a DVD player. Click the number of the menu and press the play button. In the section "Video Option" you can select the video system format (see Video Formats for details): PAL or NTSC. If you have the Super VideoCD (SVCD) plugin, you will also be able to select either VCD or SVCD. The "Burn Settings" allows you to select the CD-writer and the writing speed. Optionally you can have Nero burning Rom deal with the burning process (check "Use Nero" - this only appears in case you have Nero installed on your PC) or have PictureToTV simulate the burning process (check "Simulate first"). This last option is useful when you have never ever burned a CD with your CD-writer. To make sure the computer can keep up with the burner. In the lower part of the screen you can either select to just "Generate new video" file, "Generate new video and burn into CD" will do the same and after finishing the video fie will also brun it to CD. The option "Burn existing video into CD" burns a video file you have created previously. Commonly one selects "Generate new Video and burn into CD" - this will generate the required files and burn it on CD. In the "Save to, then burn from video file:" field, you can enter the path and filename where your VideoCD image should be stored. This is useful when you want to burn multiple copies of a VideoCD. Click "Set" to browse for a new location - make sure there is at least 800 Mb of disk space available on the disk you selected! Once you have set and done this all, you still might want to verify if you checked "Store original pictures" and see if the size indicator is not exceeding the limits of what might fit on a CD. After that click "Start". So that's basically it. I recommend playing a bit with the effects and such. Working with PictureToTV sure was fun to me!